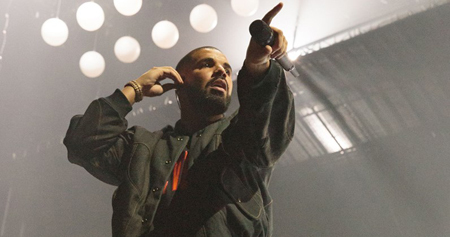 He may only want One Dance, but Drake shows no signs of vacating the dance floor as he fights off his rivals to claim a 15th straight week at Number 1. One Dance, which features Wizkid and Kyla, was also the most streamed track of the week, racking up 4.33 million listens. Jonas Blue and JP Cooper rise one place to Number 2 with Perfect Strangers, while Don’t Let Me Down, from Chainsmokers feat. Daya, slips a spot to 3. Calum Scott’s cover of Robyn’s Dancing On My Own holds firm at 4, and Kungs vs Cookin’ On 3 Burners’ This Girl is also a non-mover at 5. Shawn Mendes, who scored a Number 1 earlier in the year with Stitches, breaks into the Top 10 with Treat You Better, at 9, while MØ leaps nice places to 19 with Final Song. Highest new entry this week goes to Katy Perry. Rise, which is set to be used in Olympics’ coverage for US TV channel NBC, goes in at 25. 5 Seconds of Summer also score a brand-new entry, with Girls Talk Boys, taken from the new Ghostbusters movie, starting at 28, and French star Christine and the Queens vaults 11 places to Number 29 with Tilted. British girl group M.O. score their very first UK Top 40, with Who Do You Think Of leaping 12 places to Number 35, while MK & Becky Hill’s Piece Of Me rebounds five slots to 37. Finally, a new entry for Snakehips and former One Direction star Zayn – their collaboration Cruel goes straight in at 38. This entry was posted on Friday, July 22nd, 2016 at 7:30 pm and is filed under Music News. You can follow any responses to this entry through the RSS 2.0 feed. Both comments and pings are currently closed.